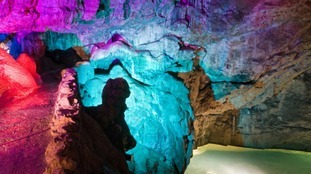 The owners of Wookey Hole plan to open up unseen caverns beneath the Mendips as part of a £3 Million explansion. Specialist consulting engineers have carried out a full geotechnical survey of rocks and plans are being submitted to bore an access tunnel through the rocks so that visitors can see a spectacular underground lake and cave formations only previously seen by cave divers. Geotechnical checks have been made and the new tunnel will take around a month of work and will be ready in time for the summer holidays. The local authority have passed our plans for this exciting new development and we start work literally tunnelling into the unknown. The new tunnel will be similar to the one created in 1973 which enabled people to see extra caverns and which is now an established part of our tour. The tunnel created then is also used to store Wookey Hole Cave Aged Cheddar. The new access tunnel will be 70 metres long and will enable people to go into the 20th Chamber, which the cave divers have always called King Arthur’s Beard because of the shape of a rock formation in it. The new chamber will give people an insight into a world only glimpsed by a few people that are brave enough to swim underwater with oxygen tanks to access it at the moment.